It’s December, and that means Terry Burr and his student workers are busy planting seed potato samples in the greenhouse. But this year, for the first time ever, they aren’t planting directly into the ground – they are planting into trays. Certified potato seed growers submit samples from their fields every year for virus detection and evaluation. Students use a melon-baller to core out the top end of each potato and plant them into trays. In about a month, the plants will be ready for inspectors to “read” live plants for potato viruses and other seed-borne problems. 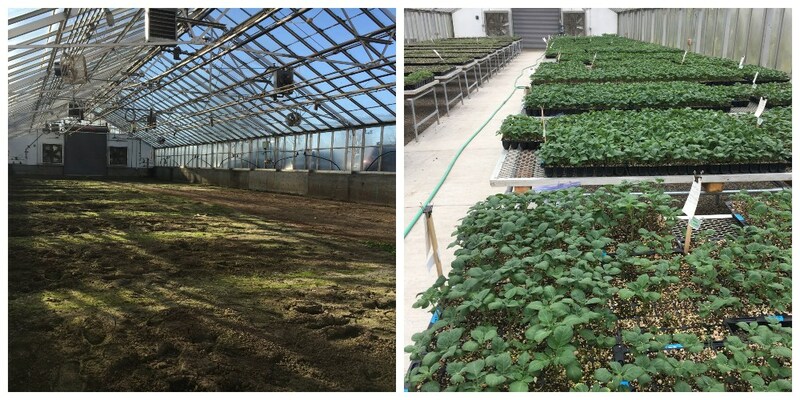 In the summer of 2018, the OSU College of Agriculture Potato Development program collaborated with Seed Certification to upgrade one of the greenhouses; the ground was leveled, graveled, center path paved, and tables were installed. Planted trays now fill the tables, and the result has been overwhelmingly positive so far. “The new system means that we cut out a lot of variables that caused problems before. We’ve seen better and more even germination, saved on labor and input costs, and have been able to get the results back to the growers much faster too.” And faster, more accurate readings mean better seed is available on the market sooner. A plan is already in the works to transform at least one more greenhouse next year.